We all brush our teeth regularly every day but the question is how good we are able to brush our teeth. The issue with the traditional brush is that it’s hard to reach some corners of our teeth that we miss out in our regular routine, it initiates the problem with your teeth in long run. if you are worried about your teeth and searching for a more easy alternative to the normal tooth brush, here we are with the solution. Aura Clean offers two cleaning modes: the recommended Super Clean, and Sensitive Clean, for those with sensitive gums and teeth. To ensure you have the most thorough and complete cleaning experience, we’ve created a map of your mouth (which can be found in the included instruction manual) that splits it into quadrants. Every 30 seconds, Aura Clean briefly pauses so that you know it’s time to move onto the next quadrant. A timed cleaning where the brush actually does the work for you, tells you when to move on, and shuts off when you’re done. It’s truly foolproof! Connect your brush head to the Aura Clean brush handle and dampen it. Apply a small amount of toothpaste to the brush head, gently place the toothbrush bristles against your teeth at a slight angle towards your gum line, and press the Power button. To change from the default Super Clean Mode to Sensitive Clean Mode, press the smaller button below Power once. (You’ll also notice the LED mode indicators below the Mode Selector button.) Using the map included with your instruction manual, brush each quadrant by slowly holding the brush head against each tooth for a few seconds before moving to the next one, letting the bristles do the work; when the Aura Clean pauses, it’s time to move to the next quadrant. 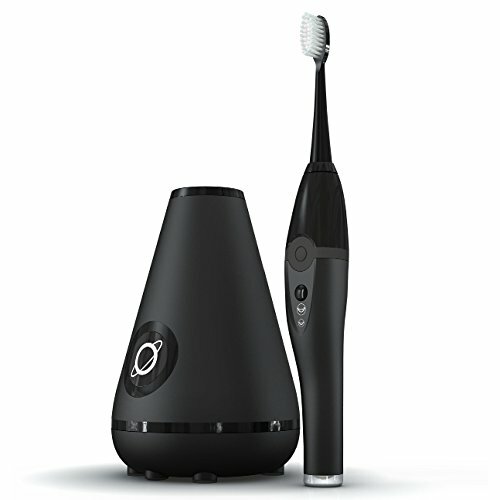 When the brush shuts off, rinse your brush of any remaining toothpaste and dock in the Aura Clean Base Station. Once you dock your brush handle in the Aura Clean Base Station (brush side down), the cleaning and drying cycle will automatically begin. While the cleaning cycle is happening, the LED light on the side of the base will turn from white to blue and pulse. Once the cleaning cycle is complete, it will turn back to solid white. Your brush will also charge while it is sitting in the dock, provided that the dock is connected to a power source.